^ There wouldn't happen to be a metaphor for Iraq or anything going on, would there? Dan Slott and Marcos Martin's Mysterio storyline continues. Martin and colorist Javier Rodriguez have been doing stellar work on this series--their artwork is totally unflashy but clear, elegant and stylish, and something about Martin's line reminds me a little of Steve Ditko's. (And occasionally more than a little, as in the image of Mysterio on this page.) Also out this week: a paperback collection of the "Spider-Man 24/7" storyline from late last year. Grant Morrison and Cameron Stewart's version of London last issue was a total joy--it had the tone of Silver Age Batman-goes-overseas stories (where everything that happens on panel is a reference to the local culture), smartened up enough to be funny and fresh in 2010. And I don't know if it's true that Morrison specifically requested that Big Ben appear nowhere on panel, but it's a great rumor. Worth reading along with #7 (and, I'm assuming, this issue too): David Uzumeri's page-by-page annotations. 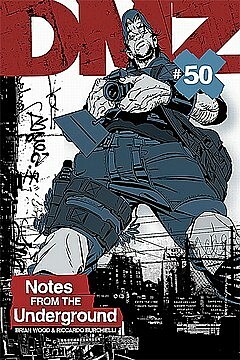 The Brian Wood-written series about Baghdad in the guise of Manhattan has been heading into some very dark territory lately--you don't get much darker than last issue's cliffhanger--so this anniversary issue takes a little break for a set of short pieces drawn by various artists. There's a preview over at Techland. Jamie Delano -- the first person to write "Hellblazer," as opposed to writing John Constantine -- and Jock's hardcover original graphic novel was initially supposed to come out in 2008 to commemorate the 20th anniversary of the monthly series. And now it's apparently commemorating the 25th anniversary of Constantine's first appearance (that would be "Swamp Thing" #37). It's a little heavy-handed, but pretty as all get-out. Extended art-only preview here. The return of Dylan Horrocks's wonderful little graphic novel about a small New Zealand town devoted to the culture of comics--it's been out of print for a bit. There's a preview at the Drawn & Quarterly site, and this edition apparently has a new introduction, too. Apparently the Vertigo/DCU character revolving door is a little less stuck than it used to be: now that a chunk of the Vertigo "Human Target" series has been reprinted, we get a new DC miniseries starring Christopher Chance, written by the character's creator Len Wein. Chris Sprouse is drawing part of it, too. Sweet. A collection of the recent storyline drawn by Michael Wm. Kaluta, who's probably better known as an illustrator these days, because for the last few decades (since "Starstruck," which is being reprinted right now too), his interior art has been a rare treat. His Rider-Waite-Smith/art-deco-derived style goes nicely with this character, too--see the panoramic view of the five covers he did for his storyline. Statler and Waldorf spring eternal, and so does Roger Langridge.